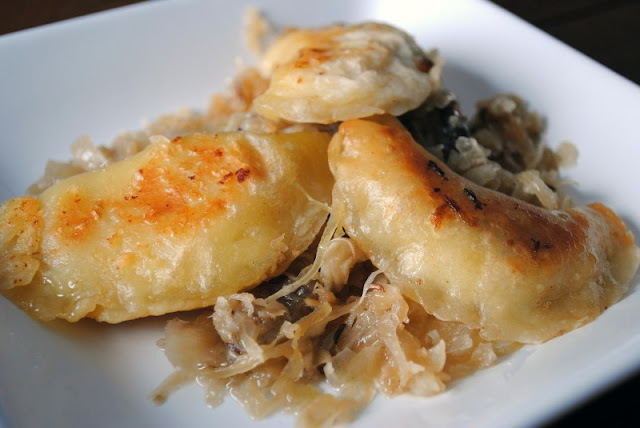 Pierogis are polish dumplings (ball of dough usually with a filling, which is boiled and then pan fried). It is a bit time consuming to make (about 1 and a half hrs.) but the results!! So worth it. Prepare the mashed potato filling first: melt the butter in a skillet over medium heat. Stir in half the onion, and cook until translucent, about 5 minutes. Stir into the mashed potatoes, and season with salt and white pepper. You can add some cheese to this mixture if you like. To make the dough, beat together the eggs and water/milk. Sift together the flour, salt, and baking powder; stir into the egg mixture until dough comes together. Knead the dough on a lightly floured surface until firm and smooth. Divide the dough in half, then roll out one half to 1/8 inch thickness. Cut into 3 inch rounds using a cup or glass. Bring a large pot of lightly salted water to a boil. Add perogies and cook until pierogi float to the top. Remove with a slotted spoon and place on a tray, dont stack them on each other or they will stick together. Once all the pierogis are boiled, put a skiller on high heat and place some butter or margarine. 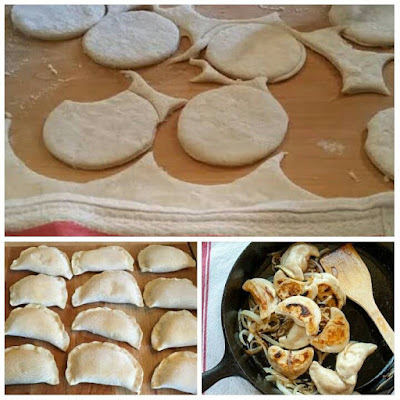 Add some onions and place the pierogis on the pan. Arrange as many as can fit comfortably. Fry each side till golden brown. Serve with sour cream on the side. Enjoy!